The thing is, Apple is so shrewd they'd clearly make their Tivo-like box do its DVR magic with no monthly fees...and continue to make their iTunes money for content-on-demand. Mark my words, I'll bet $10 that I am dead on with this. I agree that Apple is shrewd, but they are not shrewd enough to offer a device that will piss off studios and still be able to maintain the fragile hold on their iTS TV show sales. They've already lost NBC, and while this almost pure profit for the studios the profit isn't great enough to keep them there if Apple would try to undermine them with a timeshifting device. Studios hate DVRs, and for good reason. There is no reason why I'd pay $1.99 the next day if I could capture it for free that that day in a higher definition. The only way we'll see a DVR appliance from Apple is if enough studios back out of iTS to make it worthwhile. Back to being shrewd, if I were an Apple exec I'd hold the patent over the studios as the greater of two evils. I'd tell them that if they wish to back out of their iTS deals that we'd have no choice but to offer a DVR option to our customers instead. I don't believe that Apple will ever put a DVR into AppleTV. There are too many different standards, and it cuts against their basic strategy of selling/renting content. Who wants to bet me? I will bet you that a Texas court will file a law suit against Apple for some unheard of company that have a vague, all-encompassing diagram showing they invented and patented all of this in 1967 ... of course this will occur only five years after Apple have this up and running and making gazillions of $. Interesting how everyone dismisses the possibility of Apple including a blu-ray drive in Apple TV on the grounds that it would compete with their iTunes sales. And yet when the topic of DVR functionality comes up everyone thinks it's the best idea ever, and Apple will definitely need to do this. Doesn't the same argument apply that it would compete with their iTunes sales (don't they make more money off TV shows than movies)? To what end? Is this for recording to for archiving or as a storage medium perhaps? If for archiving this could be done, assuming content ever allowed, to a Local Mac and if for storage ... why have a slow limited capacity and expensive device? Sorry if I am missing your point here but I am not able to see any reason for the inclusion. EDIT: Oh ... do you mean so as to be able to play back pre recorded disks? If so why include it? A 3rd party external is probably better and more flexible. It took ten minutes for me to write this as politely as I am. Do you HONESTLY THINK there will be no charge for the TiVo like box AND for each show? There is NOTHING in this that tells me this will be a free service. Look at the iTunes Store right now. What shows do you see that you can get for free? I mean good ones from Network or Cable TV. I think there will be a charge for both the purchase of the device and the content from the iTunes music store, whether that be TV, Movies or Music. There may even be a recurring monthly charge if HBO, Cinemax etc decide to put all their content available for subscribed users. However, I don't see any type of charge for OTA DVR. The digital OTA signal carries the programming information with it so a fee for that is probably useless. My conclusion, and that is all it is, is that this box would have an ATSC tuner with Clear QAM. This way it can work with unencrybted digital cable if the user wants, but Apple doesn't have to invest in complying with the mess that is cable cards. ps. This took me about a three minutes, four tops, to prepare. Have a wonder day Sabon! I know you're joking but there will be some who think that is a good idea. Here is why it isn't: It would be easily broken and would be a strong case for antitrust. Cable card is a must. Think of the return rate when consumers find it doesn't work with their cable. Dual tuners is also a must. Three tuners? Now that would be shear bliss. Now a real question whether the Cablecard 2.0 standard will be ready when this device is. This would allow users to view OnDemand. Would Apple cripple this? I would hope not since I use it quite a bit. What would be great is if Apple made a deal with the cable companies that merged OnDemand with iTunes. So all the shows would be available for a short time for free then eventually charge for them. 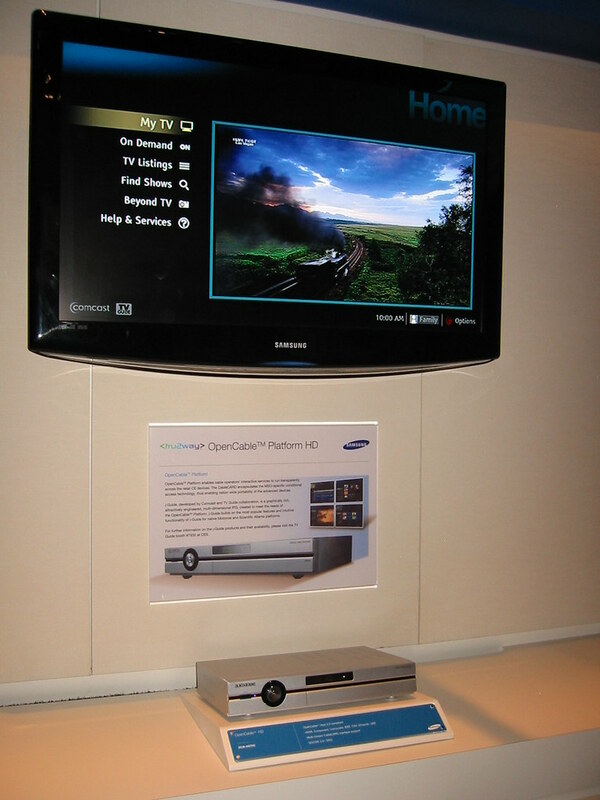 Technically you don't need CableCARD 2.0 for two-way communications services like Switched Digital Video and OnDemand. You just need the hardware to support it. For example, the latest DCH series Motorola boxes that the cable companies rent out have a CableCARD (M-Card) built in but can offer OnDemand the same way the older Motorola boxes did, by using the built-in cable modem. Formerly known as OpenCable or OCAP, Tru2way is the future. It has the support of the cable industry and all the major manufacturers are coming out with TVs and DVRs based on it starting this fall. Finally there is momentum towards a unified format that the cable companies don't despise. Yes, for playback of movies. And to your point, "include" would cover either Apple including the drive in the AppleTV or supporting an external drive (and there is no way they'd support an external drive and not offer to sell you an Apple branded one). Either way, blu-ray player or DVR, you are asking Apple to support playback of content that you aren't buying from them. Which is why I find it interesting that people think Apple will put a DVR in AppleTV and at the same time think they'd never support blu-ray. In fact, a DVR would only serve to piss off everyone from the content owners to the cable providers (who provide our internet access). Including blu-ray would be a win for everyone. If it can't tune and record my HD channels from Satellite it's a useless product. Why get something that could only record HD OTA? Also the current lack of support in the current apple tv for all video formats makes it pointless for me. Studios hate DVRs, and for good reason. There is no reason why I'd pay $1.99 the next day if I could capture it for free that that day in a higher definition. Studios DON"T hate DVRs!!! It gets their creative content played to audiences that would otherwise miss it, because of scheduling conflicts, work/life arrangements, etc. Networks DON"T hate DVRs!! They get more eyes on their programming from people who would otherwise miss it. ADVERTISERS who buy airtime for commercials that support network programming costs to develop creative content that studios produce, because viewers just zip through the commercials and only watch the program! Networks are very nervous and struggling with what to do about this, because TV Ad dollars are drying up. Last year, Big Advertising only committed half the funds they used to during the upfronts to the networks, and put the rest on the internet, where for some reason, people are choosing to watch the same shows INCLUDING commercials, just because they can get it at anytime, for no more than the cost of a connection (like, FREE, at work). No need to pay for a DVR by the month when the network lets you have the show for free, right? So why would someone pay $1-2 for a TV show on iTunes when it's available for free? Same reason we buy them on DVD --you don't have to watch commercials, and you get to keep it and watch it over and over again. [QUOTE=echosonic;1229173]My buddy has Tivo and its just kickass. But I would never, ever, EVER pay for the DVR and THEN pay a monthly fee for the privilige of having said box dial up from a phone line (or via the net) to download what is basically a freely available TV Guide. For the Tivoted, this might not be a big deal, but folks, you're paying for a TV GUIDE by the month! Well let's see...Comcast charges me $14/month to rent their crappy DVR. I can get TiVo service for around $8-9/month (yes, that requires a 3-year contract). Over the 36 months, that's a monthly subcription savings of about $200 with the TiVo. You can get the TiVo HD on Amazon for $250. So if you can get past the 3-year contract, that "kickass" you saw on your buddy's TiVo will only cost you about $50. That gets you a vastly superior interface. A much better program listing (TV GUIDE that Comcast uses is not as accurate or as informative as TiVo's guide), no more calls to Comcast to have them reset my box when things go wrong (3 calls in the last 2 months, which also wipes out the guide info because the box isn't smart enough to save it) and the ability to record OTA signals (better quality than cable). You also get a box that can rent HD movies from Amazon over the internet, browse the media content on your computer, view online photo albums, and later this year be able to browse YouTube videos...hmm, sounds an awful lot like AppleTV, doesn't it (it just can't play your DRM'd content). I think if Apple and other tech giants come out swinging in favor of Net Neutrality, government legislation can fix this problem. For those of you "free-market" zealots, remember: TELCOs were subsidized to the tune of $bllions. The free market doesn't really apply to them because they're often local monopolies. They deserve to be regulated, so that technology can advance. These scumbags want to have their cake and eat it too. Antitrust implies that there isn't another means of accomplishing the same thing, as in a monopoly, but with Tivo, Comcast, and Dish DVRs out there doing the same thing, it's not a monopolistic situation. I'm also no lawyer and don't rely on Wikipedia as a definitive answer, but I'd say such a practice would fall under the umbrella of Antitrust as anti-competitive. And judging byt he lawsuits we do see come through here, this would actually be one that would be valid. My Comcast DVR costs about $5 more a month than the digital HD box I have to have to watch the premium subscription channels (HBO, Cinemax, Showtime, Starz, etc.) and all HD content. The included OnDemand service at that tier provides hundreds more hours of programming (unfortunately not always something I want to watch, but tastes vary) in both SD and HD. The Comcast guide is accurate 99% of the time that I'm using it -- only once did something different than what I told it to end up being recorded at that time, and I've seen lots of mistakes in the TV Guide (R) as to program listings. The interface is a bit clunky, I'll give you that. I never had Tivo, so can't speak to how much worse Comcast is compared to Tivo. But don't you still have to subscribe to a method (cable, satellite, etc) to get the content that gets recorded by Tivo? That's TWO subscriptions to keep up with. I understand Tivo can let you record shows by actor/director which would be nice. I understand there's some training that must be done with the device to optimize your recording preferences. Comcast has been completely willing to let me purchase the cable/DVR box and not pay equipment fees. But I don't want to own something that gets updated annually. I usually just go down and trade it in for the latest model every year or so. Don't get me wrong - -there's a lot to dislike about Comcast service, but for me, the DVR has been dependable and enjoyable. Just pausing live TV and recording while you watch something else, or when you're asleep and the good shows are on, is worth the price alone. I'm not getting your numbers. Cable/Sat TV + HBO + DVR are a helluva lot more than $15 or $30 per month. It's probably more like $100 per month. And AppleTV couldn't even approach the amount of content you'd get for that $100, even if you spent three times that amount on TV show subscriptions and movie rentals. You're assuming one would drop cable completely. Digital cable is what, $45/mo? I'm just saying that I'm unlikely to drop digital cable. If you're thinking that all of the oddball content that makes up my personal viewing habits will be available in iTunes store, I just don't think so. I'm looking at itunes store as a supplement to DVR, not a replacement. Not yet anyway. Net Neutrality has no bearing on cable TV signals, only on internet access. The fact that the cable company's on demand services compete with internet video distribution is a loophole that the cable companies could try to exploit. By putting bandwidth restrictions (not a violation of Net Neutrality) or charging by the MB, they could put the squeeze on digital download services while their own on demand services are unaffected. As for regulation, CableCards are a result of regulation. The government said that the cable companies must allow 3rd parties to make set-top boxes (just like they said the phone company can't force you to rent a phone from them...for those or you old enough to remember that!). The problem is that they didn't say HOW they should allow that. Thus, the mess we have today with CableCards, OCAP, Tru2Way, SDV, etc. And even a year from now when much of that should be sorted out, there is nothing proventing the cable companies from changing things again. My Comcast DVR costs about $5 more a month than the digital HD box I have to have to watch the premium subscription channels (HBO, Cinemax, Showtime, Starz, etc.) and all HD content. You don't need any cable box at all with CableCards to get your premium channels. So you'd save the $5 plus whatever else you are paying for your HD cable box. You do lose OnDemand, both the free and pay stuff, but in 3 years I've only watched 2 OnDemand movies. The guide is replaced by TiVo's so you really don't lose that. All that said, I'd love if Apple did the DVR. I just don't think it'll happen for quite awhile, if ever. Likewise. This is what we've all been waiting for. Don't make us wait for AppleTV3!